Have you ever made a decision, and then tried to avoid the consequences of that decision? I think we do it all the time. We decide to stay 15 more minutes somewhere, and as a consequence of that decision, we’re 15 minutes late to wherever we’re going next. But we don’t want to be late – so we speed, take short cuts, and put a huge load of pressure on ourselves internally. At the end when we arrive 15 minutes late to wherever we’re going, it seems to usually go one of two ways: we either arrive with a perfectly rationalized explanation of why we were justified in being late (and basically deny that our lateness is a problem), or we arrive so stressed out and with a litany of why we’re overwhelmed (inadvertently asking the other to say “it’s okay, it’s not your fault,” or “it’s not big deal”). It’s like we try to avoid the consequence of our actions through justifying them, denying or downplaying our own contribution, or by asking someone else to foot the bill and make us feel okay about it. Both ways attempt to avoid the consequences inherent in our first decision – as if we could say yes to one thing without having to say no the other. After all, we can’t both leave 15 minutes late and also arrive on time somewhere else. When we choose to stay late at the first thing, we also choose in that moment to arrive late at the next thing. Being on time is a place I see this easily come up – but I think this dynamic of not accepting the consequences of our actions and trying to avoid the negative consequences inherent therein shows up in lots of places. The tricky thing is, in the short term, this works. I think that’s how we get hooked in in the first place. We rush, we take that short cut, fly by the seat of our pants and we get away with it. So why not live that way? It’s my observation that this pressure continues to build over time, and although we can often momentarily put off or avoid the consequences or suffering, pressure isn’t resolved by additional pressure. Though we might fantasize that could eventually work, in reality, we only get ourselves more stuck in the same pattern. At some point, something’s gotta give. Something has to change. These words of Christ – let your yes be your yes, and your no be your no – are a part of the Sermon on the Mount, that beautiful and challenging call to go beyond, to not just toe the line, but to fulfill the spirit of the law in love and generosity of heart. And this path not only leads to a more generous love but also to true freedom. When we try to avoid the lessons inherent in the decisions of our daily life, and try to avoid negative consequences or suffering, in the end we make ourselves less free. Christ wants to make us free! 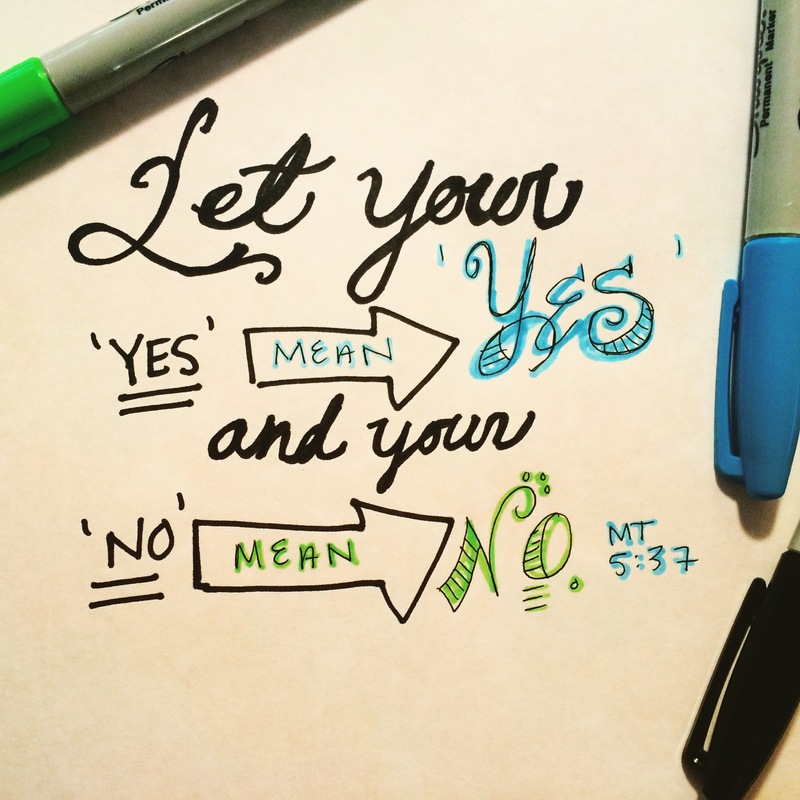 When our yes is our yes, and our no is our no, then we are free to take our bearings from Christ, instead of running to and fro driven by pressure and anxiety. No justifications or excuses needed, and no ‘free pity passes’ from others required. In this way, we work to assume the consequences of our life, so that freedom and responsibility both grow together. And if we feel encouraged to take a step in this direction, let us remember that Christ extends this invitation of freedom to each of us, and He extends it in the fullness of His personal love for each of us. He sees the challenges and stress that we are up against, and if we let Him, He will use every obstacle, suffering and consequence to help us grow each day more into that person He has created us to be – a person of faith who walks calmly and steadily through the storms of our times, a person of deep relationships who breathes steadiness, decisiveness and courage into the lives of others, and a person of humility, who is open to learning from God in every moment of life. ← Where Is Jesus? ← Why Mary?